"That game where everyone gets to pick the big guy." 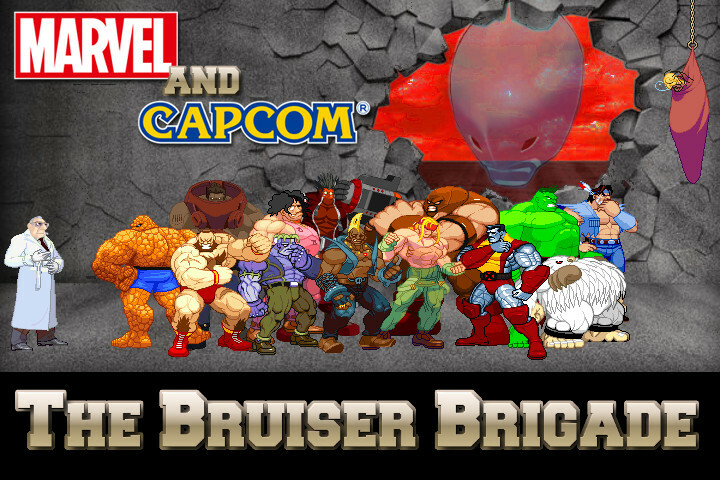 The Bruiser Brigade is a tactical beat'em up video game where you control members of a tough guys team (a la "Expendables") sent on supposedly dangerous places to deliver hell and "fix" problems. The Bruiser Brigade main mode is called "Decontamination". In this mode, the goal is not to beat all your foes, but to clean the stage from a virus. It requires a lot of management and tactical operations. Be sure to check the tutorial stage to understand the rules. The game also features a more classic "Beat 'em Up" mode. The Bruiser Brigade gameplay can be divided into three components : a beat them up component, a tactical component and a platforming component. To begin with, you control one main character with which you can move by pressing the directional keys and attack foes by pressing the different action buttons, creating various combos. On top of that classical beat'em up system, you can summon ally characters which will fight for themselves and of which you can order to do tactical maneuvers (e.g. positionning on the left side of the battlefield, getting ennemies attention, ...), this through the right usage of the management menu and special buttons combinations. Enemy behavior is not stable over time : on the one hand, they become more and more aggressive and dangerous as they are not attacked (to eventually faint from exhaustion ! ), and on the other they will start to fear and back away if they get mangled. Be careful though as attacking a frightened enemy can instantly trigger a frenzy survival reaction ! The main point being to choose your target wisely. The world is at stake. Last week, the powerful moustache wearers suddenly started what seems to be a rebelion to dominate the world. Since, others illustrious groups have risen around the world. Violence outbreaks are being "organized", the world is in the grip of a mysterious and sudden madness. Strangely, only men with gargantuan strength seem not affected by this epidemy. It would appear that these colossus are immunized by their extraordinary high testosterone level, preventing what seem to be a virus from developping. For supreme peacekeeper inspector Derrick, three points are clear : time is running out, the future of the world resides in the hands of these "bruisers", and these guys only know how to do one thing. Thus was born the Bruiser Brigade initiative : the greatest heavyweights champions will be united in order to organize the counteroffensive and thump all trace of the virus until its completly eradicated. Will these unexpected heroes be able to re-establish order and rivalize with the hairy-nosed beings and other dangerous opponents ? What is the origin of this sudden and global madness ? First, the usage of a controller is greatly advised to play the game properly. There is four action buttons : punch, kick, special, and jump. The first three allow you to start and chain attacks while the last one allows you to jump in the air. Note that holding directional keys while performing attacks will make your character use different combos variations. In addition to these action buttons, there is two triggers buttons : the block modifier and the break modifier. The "Block Modifier" is intended to be assigned to the left trigger of the controller and the "Break Modifier" to the right trigger. When you hold these triggers, your character will have access to different moves. When you hold the "Block modifier" button, your character will go into guard stance and pressing action buttons from this stance will launch different moves (block + jump = evade or back dash). When you hold the "Break Modifier" button, pressing action buttons will launch powerful special moves (which behave differently depending on the directional keys you are holding) (break + jump = dash forward). Typically, holding break modifier and pressing an action button will launch a charging/jumping attack in the direction of your choice. Holding both "Block" and "Break" modifiers will trigger a breakout move. Advanced evade system : some enemies learn your moves as you attack them, and the more you use them, the more they will evade them. Vary your attacks so that your enemies don't avoid them too often. Typically, slow attacks are easily avoided by enemies, while fast attacks are very difficult to avoid. L’idée est bonne (vue sur forum CPC) et les vidéos donnent envie même si je reste perplexe sur le principe de décontamination. Je dl, teste et revient poster un commentaire sur le site plus tard. Je reste bloqué sur le « appuyer sur start » car le jeu ne reconnaît apparemment pas ma manette filaire Xbox 360 (Microsoft) :il ne se passe rien quel que soit le bouton ou la gachette utilisé (et même en appuyant sur Entrée de mon clavier d’ailleurs, il ne se passe rien). Quand j’ai constaté ça, j’ai éteint le jeu et sans toucher à rien, j’ai lancé StreetOfRageRemake et la manette était bien reconnue, j’ai pu jouer sans problème. Il y a donc un petit soucis à ce niveau là. Je suis sur Windows 10 si ça peut jouer. Mince c’est bizarre que le clavier ne fonctionne pas ! La manette ça se comprend qu’elle ne fonctionne pas direct sans mapper les touches dans la configuration mais le clavier étrange ! Tu peux tenter de supprimer le dossier « Saves » dans le dossier du jeu et retester (avec le clavier) ? – Dans option / joueur 1 / configurer chaque touche avec la manette. Et voilà. Pour le retse des retours, je passe par le forum CPC en MP.